In his accounts of the Gallorian Wars, Captain Caesorian described the widely famed "Certamen Centurionum". On the seventh and most serious day of the siege, two rivalling sergeants throve to outdo each other in battle. Both left their lines and charged headlong into the enemies position, watched by their battle-brothers, Titus Pullo threw himself into the enemy and caused havoc among them. But mankinds foes rallied and just before Pullo would be taken down, his rival Verenus reached the site and saved him. As in return he got nearly overwhelmed, Pullo came to fight at his side and together they slaughtered so many opponents, that their lines broke and they took the position, shouting the emperors name. The "Competition of the Centurions" became a vivid symbol within the ranks of the Ultramarines for the strength that lies in unity and the trust and friendship of the battle brothers. 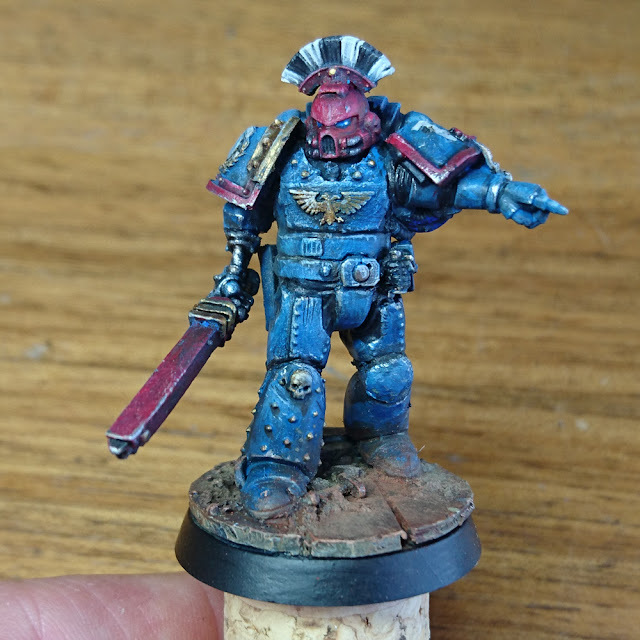 Inspired by the events Ceasar described in his "de bello galico", wich where converted into the great series "rome", i tried to do my version of Ultramarine Veteran Sergeant Lucius Verenus, the first of the two Centurions. Was quite a fun to paint and i am happy to hear your comments on him. For sure, Pullo will follow at some time (or the other).